It can be emotionally challenging to buy stock in a company that's soared in recent years, but here's why you should put emotion aside with Boeing. What goes up must come down. Boeing (NYSE:BA) isn't listening to any of that logic, however, after posting the best performance in the Dow during 2017 and a stock price that's soared more than 150% over the past three years. But is the stock running on fumes, or poised to fly higher? Here are three reasons Boeing stock could keep rising. Boeing is far from a young growth company, but that doesn't make growth any less important for potential investors. The good news is that management believes it's seizing opportunities in its biggest growth market: global services. Boeing agreed to buy aerospace parts distributor KLX Inc. for an enterprise value of $4.25 billion, including $1 billion of net debt, contingent on KLX spinning off its energy business. The goal is simple: expand into a highly profitable business of offering spare parts, maintenance, and general services over the years that aircraft are in operation. It's a lucrative market. Boeing intends to win its slice of a market for 10-year service contracts that's estimated to value $2.6 trillion between 2017 and 2026. In fact, CEO Dennis Muilenburg plans for the Boeing Global Services (BGS) division to reach $50 billion in sales within 10 years. For investors, that's a juicy addition to the company's 2017 full-year revenue of $93 billion. That's how many new commercial aircraft management predicts will be needed globally over the next two decades. That's a market value of $6.1 trillion -- a large pie that Boeing is well positioned to take its slice of. Higher living standards and a growing middle class in China are expected to push its traffic growth 6.1% annually over next 20 years, eventually surpassing North America to become the world's largest domestic air travel market, according to Boeing's most recent market outlook. In fact, Boeing expects new airplane deliveries to the Asia-Pacific region to top 16,000 of the aforementioned 41,030 commercial aircraft -- which is almost double the second closest region (North America, at 8,640 new aircraft). As those trends continue, it should push global air travel and aircraft demand higher in the coming decades. And that's just the future growth of Boeing's commercial aircraft business. Investors can't overlook the potential in Boeing's defense products, with this administration's planned defense spending increases. And the Air Force T-X training jet contract, worth roughly $16 billion, is up for grabs. The Air Force should announce which company will supply the 350 new training aircraft sometime in 2018 unless the decision is further delayed. It's no secret that investors covet dividend stocks, and few companies have boosted their dividend over the past few years like Boeing has. Even better for investors is that as Boeing cranks up production of commercial aircraft to work through its backlog of orders, it could generate more cash to fuel further dividend increases. In fact, the high-margin 737 is planned to reach 57 airplanes per month by the end of 2019, compared to roughly 42 per month as recently as 2016. Wall Street is a believer in Boeing's cash-printing potential. Cowen & Co. analyst Cai von Rumohr recently reiterated his outperform rating and $430 price target. Rumohr also noted that its cash flow per share could reach $32 by 2021, enabling the company to potentially boost its dividend to $10.50 per share, up from $6.84 today. Sure, Boeing has soared in recent years, but that doesn't mean its stock price is coming down anytime soon. 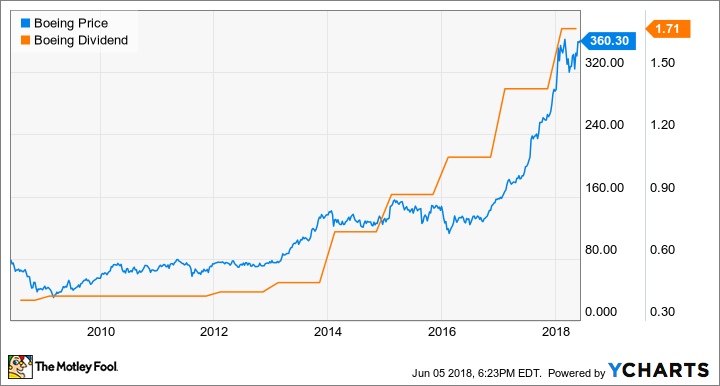 It's expanding into the highly profitable services business in a big way, has upside with long-term commercial aircraft demand and lucrative defense contracts, and produces strong cash flow that could fuel its rising dividend -- three obvious reasons Boeing's stock can keep rising.